When I first heard about lactation cookies, I really thought that it was something that it was an excuse to just eat cookies. I soon learned how very wrong I was. 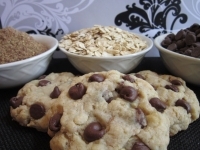 This mix made by Good Natured Gourmet makes it so easy to make great tasting lactation cookies in your own kitchen. Much like you would make a packaged cookie mix you buy in any grocery store. There are key differences in these cookies that make them good for lactation. They contain ingredients that are good for you and they do increase milk supply. They contain barley flour, brewer’s yeast, flax seed, whole grain rolled oats and a boost of calcium. Some of you may have heard about women drinking a dark beer to increase milk supply for nursing mothers, and that is where the brewer’s yeast and the barley come in, both of these are known to help a woman make more milk. Brewer’s yeast is a good source of B-vitamins and amino acids. Flax seed is a great source of omega-3 acids and when taken by a nursing mother, it will increase the omega-3 levels in her milk. Many formulas are adding this to their ingredients to help with baby brain development; of course, it is so much better if you are getting it in your diet to get in your milk. We all know that whole grains are good for us even when we are not nursing a baby, so it would make sense that they are included in this mix by Good Natured Gourmet. Many women are told to eat oatmeal daily to help with their milk production; it is a good source of iron, fiber and many different vitamins and minerals and also increases milk production. The extra calcium in this mix is fantastic for breast milk production and it helps ensure strong bones in mom and baby. The calcium levels in a mother’s body can become depleted while nursing and this is an important thing to include in your diet. Then of course, you come to the ease of making these cookies; you just soften some butter, add some water, mix, and presto you have two dozen cookies that are fantastic for you, and fantastic to help you make more milk for your baby. Good Natured Gourmet fits the bill all around. Nursing is important and if a mom is struggling with a low supply then it makes is hard for them to keep nursing. Everything that can be done to help a nursing mother succeed is so important, and if they taste as good as these cookies do, that is just such a great bonus! The Good Natured Gourmet is sponsoring a giveaway for our readers and you can enter below. Good Luck! I love oatmeal raisin and snicker doodle! Definitely the oatmeal chocolate chip- favorite cookies flavor! I love white chocolate chip with macadamia nuts cookies. Oh this is super tough call, but I’m going with a double chocolate – chocolate cookie with white chocolate chips specifically.